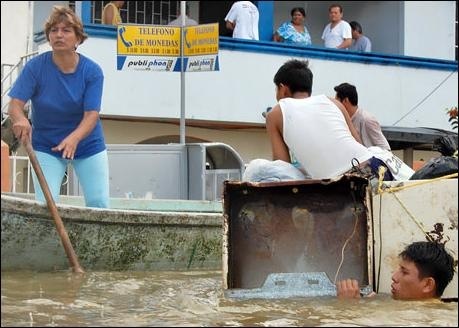 VILLAHERMOSA, Mexico (AP) — Hundreds of thousands of Mexicans fled a flooded region of the Gulf coast Friday, jumping from rooftops into rescue helicopters, scrambling into boats or swimming out through murky brown water. President Felipe Calderon, flying overhead, called it one of Mexico's worst recent natural disasters. Workers tried to protect Villahermosa's famous Olmec statues by placing sandbag collars around their enormous stone heads, and built sandbag walls to hold back the Grijalva River in the state capital. But the water rose quickly, surprising residents used to annual floods and forcing soldiers to evacuate the historic city center. The dikes failed Thursday night, and water swamped the capital's bus station and open-air market. Rain gave way to sunshine Friday, but tens of thousands of people were still stranded on rooftops or in the upper floors of their homes. Rescue workers used tractors, helicopters, jet skis and boats to ferry people to safety, while others swam through water infested by poisonous snakes to reach higher ground. Calderon met with state officials, flew over the affected areas and visited a makeshift shelter. The extent of the flooding was clear from the sky — Tabasco state seemed like an inland sea with only rooftops and treetops protruding from the water. In a televised address late Thursday, the president called on Mexicans to donate emergency supplies as the government trucked in bottled water, food and clothing. "The situation is extraordinarily grave. This is one of the worst natural disasters in the history of the country," Calderon said. Mexicans across the country responded by contributing money and supplies. Television stations dedicated entire newscasts to the flooding and morning shows switched from yoga and home improvement to calls for aid. Friday was the Day of the Dead holiday, but banks opened to accept donations for flood victims. Food and clean drinking water were extremely scarce in Tabasco state, and federal Deputy Health Secretary Mauricio Hernandez warned that there could be outbreaks of cholera and other waterborne diseases. "With so many people packed together there is a chance that infectious diseases could spread," he said. Officials tested for 600 suspected cases of cholera, but none was positive, he said. The waterborne sickness, which can be fatal, has not been reported in Mexico for at least six years. The government also sent 20,000 Hepatitis A vaccinations and were giving booster shots to children to prevent outbreaks, Hernandez said. Medical care was difficult, however, because at least 50 of the state's hospitals and medical centers were flooded. Hotels, parking garages and other dry structures were converted into temporary shelters for those forced from their homes. Guadalupe de la Cruz, a receptionist at the Hotel Calinda Viva Villahermosa, said the hotel's meeting rooms were being used as shelters for employees' families. She said the 240-room hotel was completely booked, mostly by people who had fled their homes. Many people were headed to nearby cities unaffected by the floods. Highways that weren't covered with water were packed with residents fleeing in cars and on foot. Villahermosa resident Mauricio Hernandez, 27, who is not related to the federal official, paid a taxi to go to Cardenas, 30 miles away. From there, he planned to hop a bus to the port city of Coatzacoalcos. "We are leaving because we cannot live like this," he said. "We don't have any water, and the shelters are full. Where are we going to go?" State officials sent 50 buses to a museum in the capital where hundreds of people gathered. "We wanted to stay in the city but it is no longer possible," said Jorge Rodriguez, 43. "We have lost everything."